How’s everyone’s weekend going? 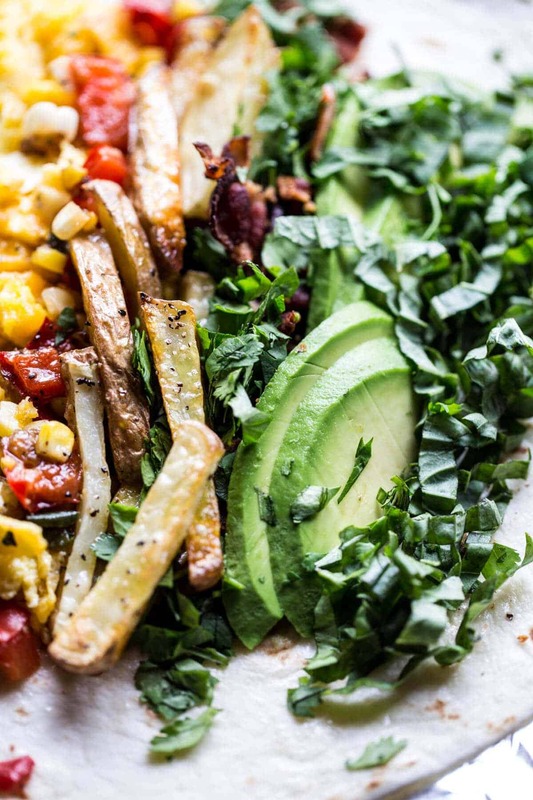 I’m stopping in real quick here today to share these delicious avocado breakfast burritos. I think it’s no secret that breakfast foods are one of my very favorites. …and I could go on and on and on. FOR REAL. I love breakfast! I love making breakfast foods, not only in the morning, but for me…breakfast is awesome any time of day! Typically, I’ll choose sweet over savory, but that all changed when my brother convinced me that I NEEDED to make him a breakfast burrito. Going to be honest here, before these burritos, I’d never even had a breakfast burrito. I know, I know, what?! So yes, I’m a little late to the breakfast burrito game, but don’t worry, I’m making up for lost burritos with this one… from here on out, I’ll be making them on a weekly basis! I mean what’s not to love…eggs, peppers, bacon, CHEESE and avocado. 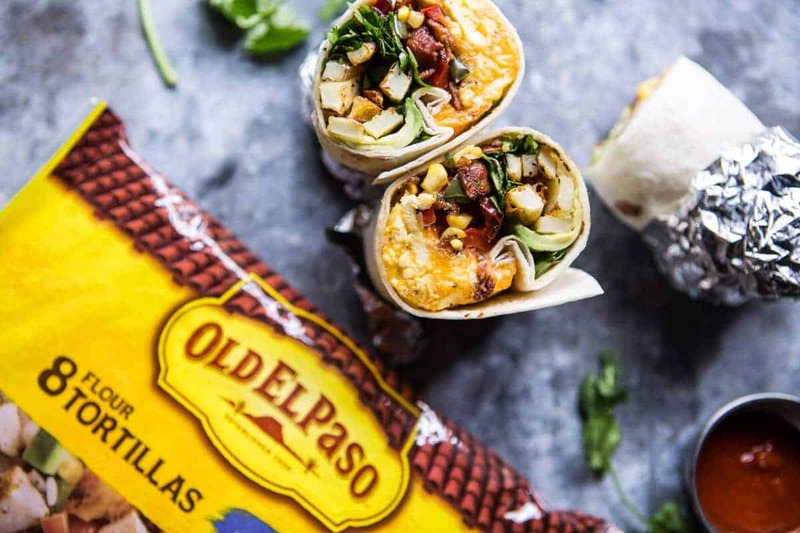 Absolutely the best ingredients all wrapped up into a warm and yummy Old El Paso tortilla. Perfect anytime, and my kind of meal! 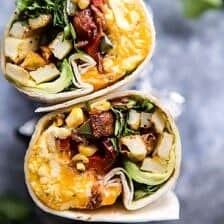 These burritos are great to make a double batch on Sunday and then throw in the freezer for the fastest and most delicious busy week day breakfast. All you have to do is cook them in the microwave for a minute or two or until they’re hot and perfect. If you don’t own a microwave, like me, just thaw the burrito over night in the fridge and place the burrito (still wrapped in foil) in a 350 degree F. oven for 10-15 minutes or until hot. Also, don’t ask why I don’t have a microwave. I mean, I probably should, but after being without one for over a year now, I just never even think about wanting to use one. Weird, right? Anyway, the best part about these burritos? These are SO easy to make! I used a mix of fresh veggies I had on had…so sweet corn, a poblano pepper, bell pepper, tons of fresh cilantro and avocado. Totally all the things I love! Avocado Breakfast Burrito from Half Baked Harvest on Vimeo. 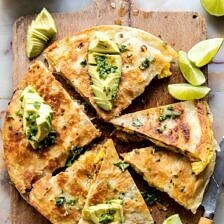 Breakfast Quesadilla with Soft Scrambled Eggs and Avocado Salsa. 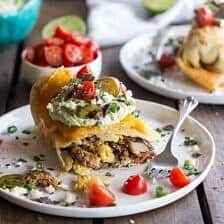 Breakfast Chimichangas with Avocado + Cotija Cheese. Ignoring the cheese (obviously!) 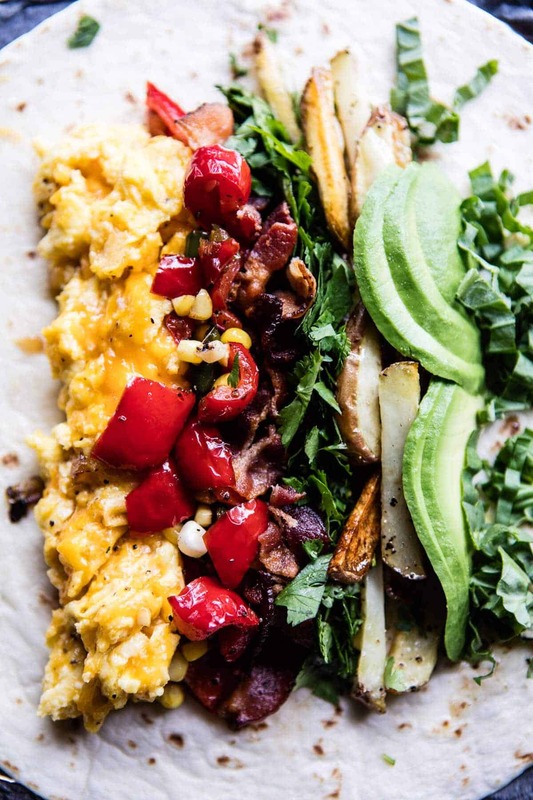 there is all of my favourite things in here – I love me a good breakfast burrito. And why have I never throughout of putting avocado in before?! I totally forgot about it for A while too!! Thats so amazing your recreating it!!! I’m sure it looks amazing!! You’re truly gifted your pics and recipes look so delicious! Just curious,what do you think would happen if I added sweet potato fries instead? I’m not as daring with food,lol…. Hey Ogie!!! Oh my gosh, I think sweet potato fries would be DELICIOUS! What a great idea!!! Go for it I say! Let me know if you have any questions at all. Thanks so much! ? This would be good for any meal. So glad you think so, I’ve totally been eating it for more than breakfast!! haha! Thanks Nancy! I hope you got to try them!! Thanks so much Emma!! Yes, please! I usually go for a sweeter breakfast, but these would make for the most perfect brinner meal!! 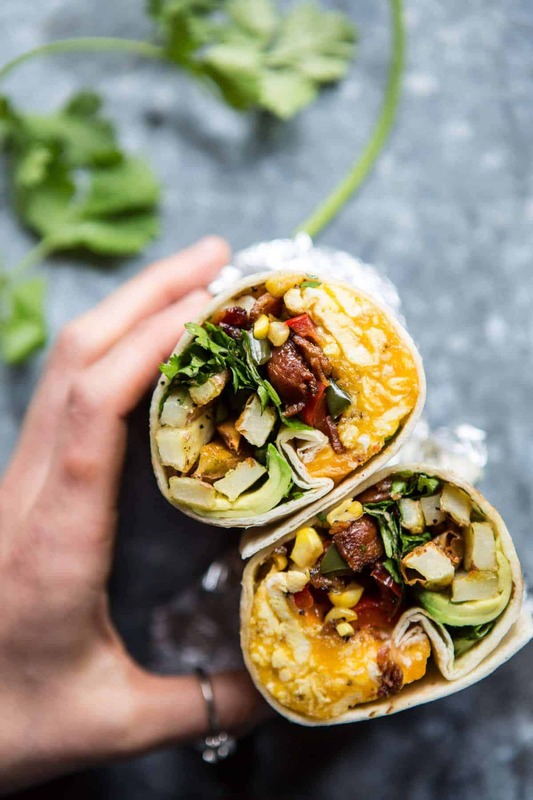 These look gorgeous, and you’ve totally convinced me to try a breakfast burrito now!! YAY! I hope you love them Rhian!! 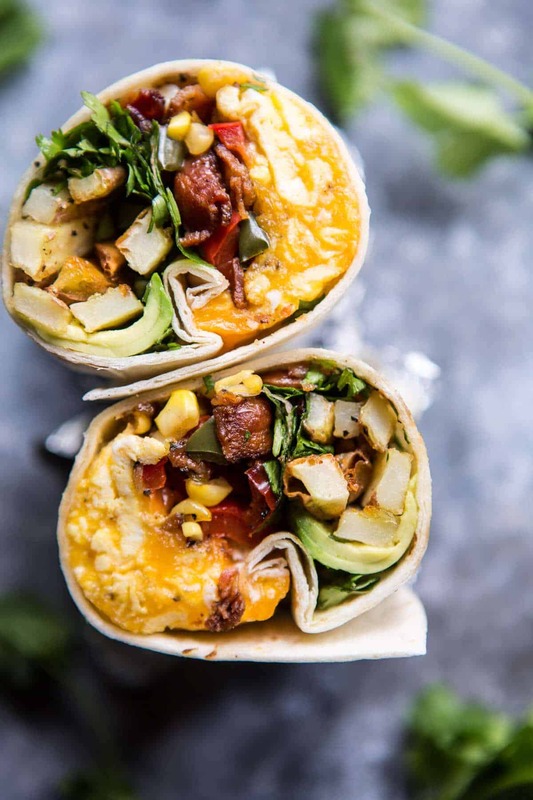 I love breakfast burritos and these look amazing..the only thing I may add would be a jalapeno or some hot sauce. Some spice is a great idea!! Hope you get to try them!! Thank you! Oh come on!! You got this!! but thank you so much Andrea!! These look delicious! We make breakfast burritos a lot and use tator tots for the potatoes, which are perfect since they are so small. Thanks for sharing your amazing talents wth all of us! Tater tots work great i’m sure!! sounds delish! Thank you Denise!! Breakfast burritos are my favorite Tieghan! Perfect for on the go! Love that you added the avocado and french fries! So happy you like them Mary Ann!! I have to say the avocado is the must have for me!! These are SO GORGEOUS! And everything that I love. I want this for dinner tonight and then breakfast tomorrow…..and then lunch too probably haha. Great job! Thank you!!! Hope you get to make them Chelsea!! Let me know what you think!! Yes!! 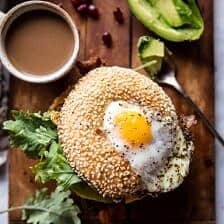 It would be a perfect breakfast for dinner!! Let me know what you think! Thank you!! Fries in a breakfast burrito ! One thing : GENIUS ! Perfect!! I hope you love it Alice, enjoy!! My brother totally talked me into them! Yes, i’m excited to freeze them and have the easy perfect snack!! Haha I hope you both love it Morgan! Thanks so much! Let me know how it goes! Oh my oh my these look sooo good! I could go for one right now! I hope you love them when you try them!! Thank Jessie! we are SO going to be eating these sunday!!! Oh thanks so much Lisa, will definitely try this next time! Hope you love these!! Yum yum and more yum, pinned and ready to make soon! Thanks for sharing! Yay!! Hope you love it, thanks Missy! 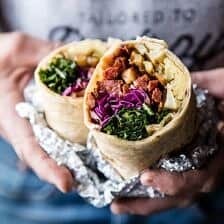 Hey, was just wondering if you know how many calories are in this, per wrap?? These look delicious! Do you know if the avocados hold up well when they are frozen? I’m making a bunch for some friends and would hate to have brown nasty avocados in them when they are microwaved 🙂 🙂 thank you! Would it taste okay if garlic was added to this? Sure! Garlic will be great! Hope you love the burritos! Will the avocado in the burrito still be tasty after you freeze and rewarm them? Oh wow, I tried this and it was AMAZING!! I was a little skeptical about the corn being in a breakfast burrito, but hey, it works!!! I like Ogie’s idea of sweet potato fries, I think they would work well in this!! Delicious burrito as is though, thanks!! Thank you Michelle! I am so glad you loved this! Add the garlic, none listed in ingredients list? No garlic in ingredients list and we don’t put the vegetables in the burrito?